Called into Karratha to refill the gas bottles but it was a Sunday afternoon and everything had just shut. We tried all the industrial areas, the hardware shops and even an Adventure Sports shop, same story, "Never on Sunday". 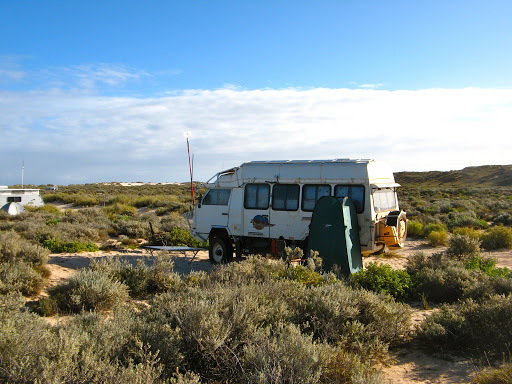 On the way out of town we spied a Big 4 Caravan Park, not noted for their economic rates but gave them a try anyway. Sure enough, "No problems, I'll do it straight away". The old guy came back staggering under the load of 2 full gas bottles "3Kg are they?". "No they're 4kg" (and I kicked J since they are actually 4.5kg). So away he went and happily charged us for 3.5kg bottles. Go figure. However our joy was short lived as one of them started leaking and we lost a fair bit of gas before we noticed. The old (and obviously inexperienced) filler had failed to tightened one of the valves properly. Camped at 40 Mile Beach campgrounds that Dave had told us about, just past Devil Creek about 20km south of Dampier, and run by Roebourne Shire. Only $7 for ocean views (beyond the mangroves) and plenty of seclusion and sunsets. Worth a longer stay one day. The caretaker lived on-site and we had some difficulty finding his van, but eventually his veggie patch gave him away. He thought the large sign out the front reading "Caretaker" should have given us a clue. The most boring of scenery as we drove south, almost featureless grassy plains and a few low hills. We played guess the height of the microwave towers which appeared every 30km or so. Drove down past Nanutara Roadhouse, which was out of diesel "It's coming in either 10 minutes or maybe an hour". OK is there some water we can fill our tanks from then? "No", and he walked off. So we drove off taking our custom elsewhere. 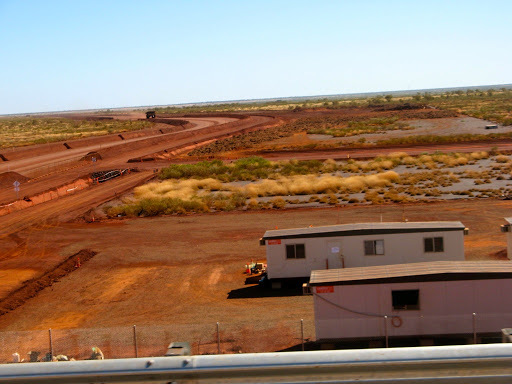 There is a lot of new mining activity in this area, judging by the huge new haul roads that are being built. Camped at Yannerie River rest area in a huge flat expanse but well serviced by a dump point, clean toilets, BBQ places and tables and chairs. Drove the remaining 250km into Exmouth amongst improving scenery and full of expectations, filled up with free water at the visitors centre and then passed a sign saying that all campgrounds in the National Park were full. Bummer. 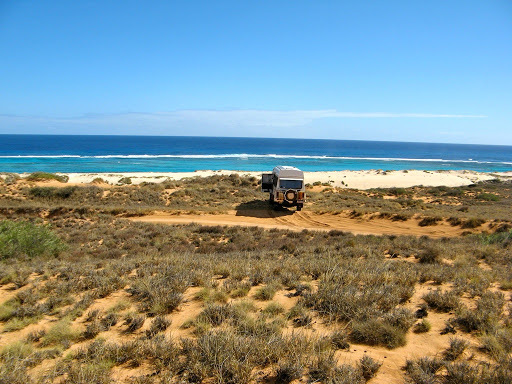 I got very frustrated as all the caravan parks in Exmouth were also chockers and we almost abandoned Ningaloo for this year, but having driven 1000km to get down here from 80 Mile Beach we gave it one more chance. We ignored the full signs and drove 50km around to the park entrance and happily there is a caravan park (Yardie Homestead) just outside the park, which had some economic unpowered vacancies so we checked in for 2 nights. I was further cheered by a very helpful (and pretty) park ranger on the entrance gate who told us that the entrance fee was halved for concession holders, although she doubted that we were old enough anyway (bless her little King Gee work shorts). 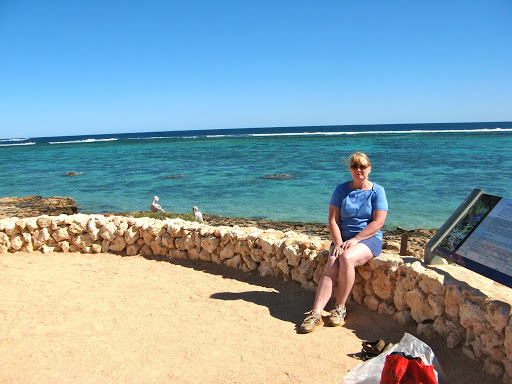 We were amazed at the large number of people sitting in and milling around the caravan parks instead of out enjoying the reef. 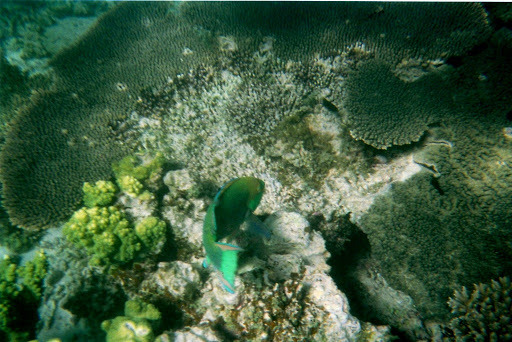 Out on the beaches and reef there were relatively few people. 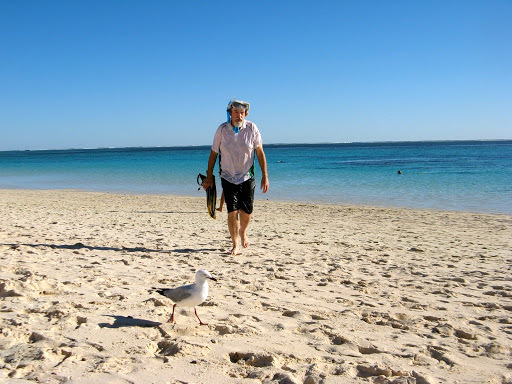 So we went snorkelling at the almost deserted Turquoise Bay a lot happier than earlier in the day. 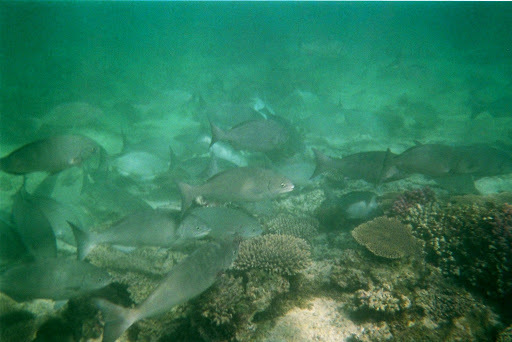 J even saw a shoal of large silver fish. A large American lady claimed her daughter saw a blue ringed octopus but I doubted that, as I thought they were a QLD speciality. Correction, they do live in all Pacific and Indian ocean tropical areas but I still think it's unlikely that's what she saw. But when I read the words "no antivenom is available" and "10,000 times more toxic than cyanide" in the same sentence, I vowed never to go near one. From Wikipedia: The blue-ringed octopus is 12 to 20†cm (5 to 8†inches), but its venom is powerful enough to kill humans. There is no blue-ringed octopus antivenom available. The octopus produces venom that contains tetrodotoxin, 5-hydroxytryptamine, hyaluronidase, tyramine, histamine, tryptamine, octopamine, taurine, acetylcholine, and dopamine. The major neurotoxin component of blue-ringed octopus venom was originally known as maculotoxin but was later found to be identical to tetrodotoxin, a neurotoxin which is also found in pufferfish that is 10,000 times more toxic than cyanide. Tetrodotoxin blocks sodium channels, causing motor paralysis and respiratory arrest within minutes of exposure, leading to cardiac arrest due to a lack of oxygen. The toxin is produced by bacteria in the salivary glands of the octopus. Went snorkelling at Oyster Stacks this morning, very good but difficult to enter the water off the sharp rocks with the sloshing of the waves. 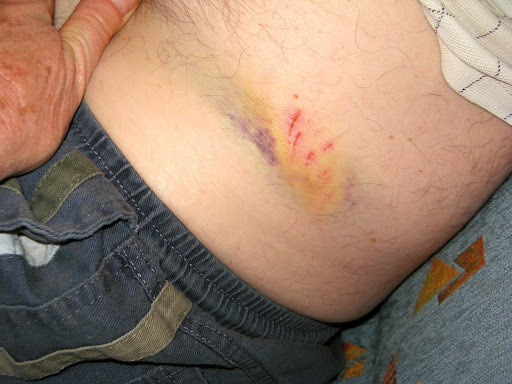 I got a bad graze on my left hip and remember thinking "That'll attract the sharks". 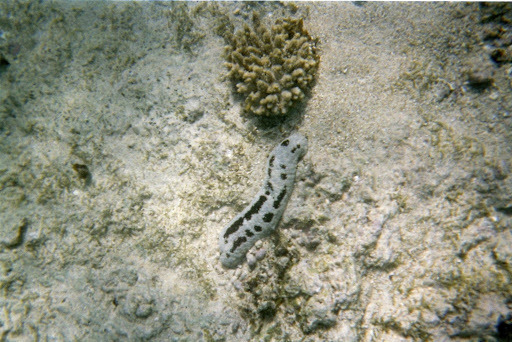 But all was well and I took copious photos of fish and coral (but no blue ringed octopi) with the Kodak underwater camera we bought at the visitor centre only this very morning. Sadly, the Exmouth processing center is closed for a month so they'll need to be developed somewhere else. 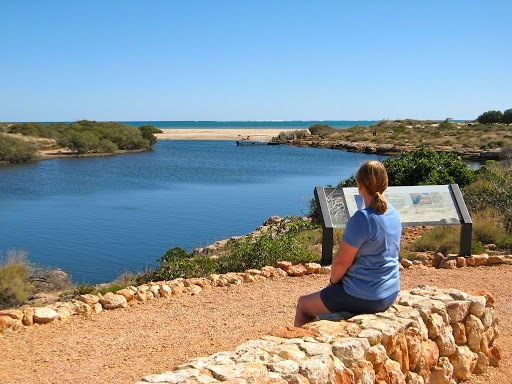 Later we went down to Yardie Creek and took a walk along the cliffs over the creek for spectacular views of the reef. 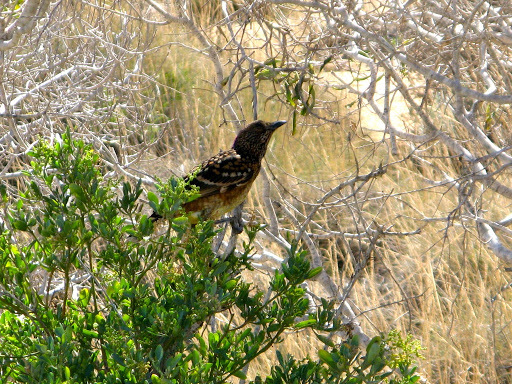 We saw a bower bird along the way. 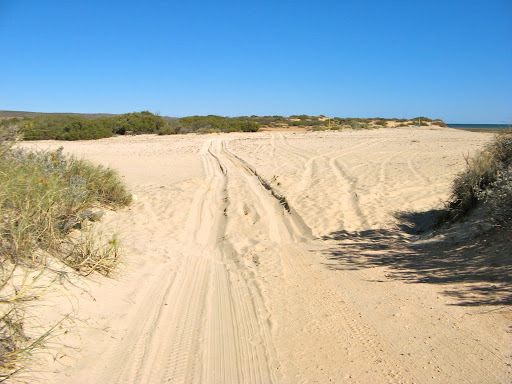 The sand bar crossing was bone dry this year, unlike 2007 when it was a foot deep in soft sand and salt water. Fortunately we didn't need to do the crossing again but we have done it before in the LR. 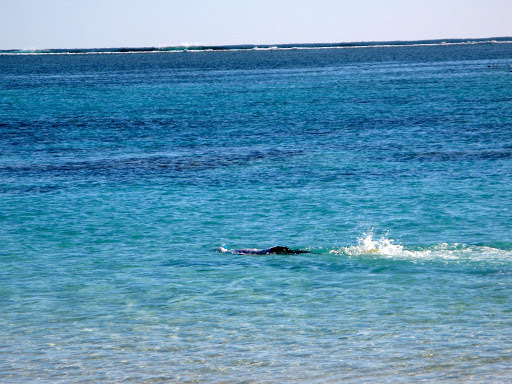 Apparently cyclones or ultra high tides can breach the 100m wide sand bar which usually separates the creek from the ocean and then sharks, turtles, rays and dugongs can enter the creek where they are trapped for several years before the mouth is opened once more. 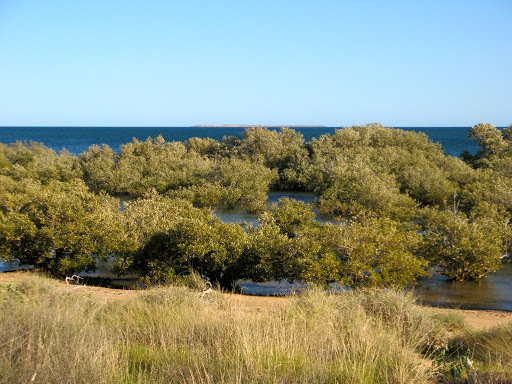 Cyclone Vance dumped 250mm of rain in the area in1999 and the creek mouth was open to the ocean for 3 years. On the way back we called into Turquoise Bay again and J did some serious snorkelling for the first time on the Drift Loop and enjoyed it. I used up the remaining photos on her efforts. Now we have to go back there again tomorrow. 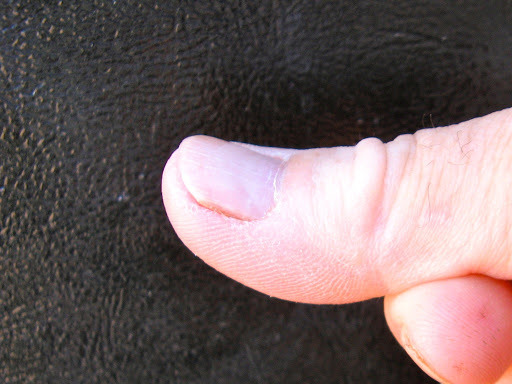 My thumb now hurts, a combination of salt water and dry air which has cracked the skin alongside my nail. I thought you should know this. Had a really clear radio hook up with D and P tonight and it's quite heartening to hear the radios that I had resurrected talking to each other so well over a long distance. Had to venture into Exmouth today to sort out a Centrelink problem. The lady in the agency claimed her computer was a male since it took a long time to warm up and could only do one thing at a time. I suspended my armed response since she fixed our problem immediately by bypassing the normal 1 hour wait on the phone queue. Checked out the facilities at Worroora Station south of Coral Bay for coastal camping. 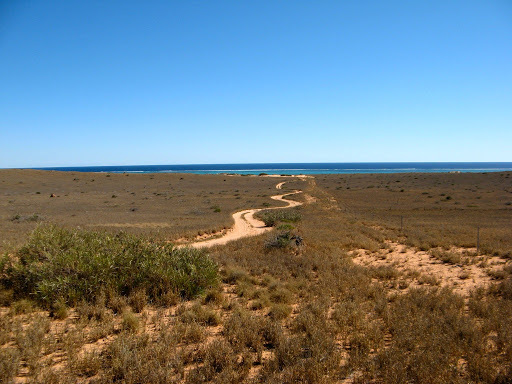 They only have 51 km of Ningaloo Reef as their western boundary so I'm sure we'll fit in somewhere. We'll head down their tomorrow for a few days. Bought fresh prawns from the Kallis fisheries shop in the Driftwood Centre and did some inevitable supermarket shopping. Scott called whiIe was sending him an email so we had a long chat instead. Filled up one side tank at the Vlamingh Head Caravan Park since it was 6 cents cheaper than in town. 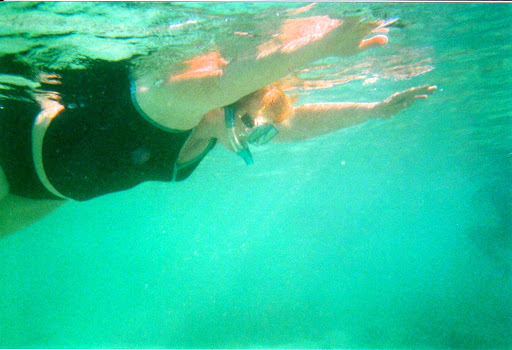 Went back to Turquoise Bay for more snorkelling. J did very well, drifting over a garden of coral well out of her depth for the first time. Left campsite to head south. Bought fuel again at the Lighthouse CP, 6 cents less than in town. Called in to visitor centre to get water and met Dave and Janine in Oka 134 for an hour. Checked emails and headed south to Bullara Station overnight. OK but not brilliant for a rustic cattle station. Had BBQ and campfire chats with several ladies who retired to bed at the very late time of 7.30. Met Pauline (late 20's) travelling alone with her 3 year old son in a small motorhome. Brave thing to do but she seemed very level headed about it all. My thumb has been hurting again. I really must do something about it. 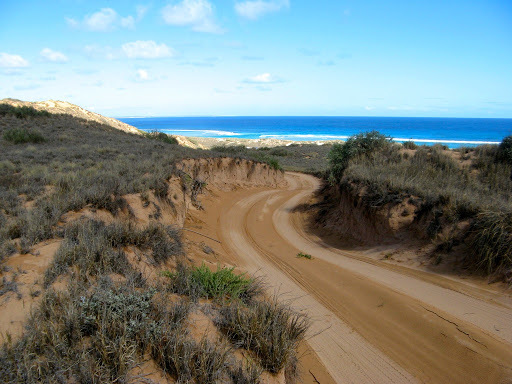 Drove down most boring countryside, grey sand hills covered by grey spinifex and nothing else. Past the Coral Bay turn off (apparently very crowded) on to Warroora Station. 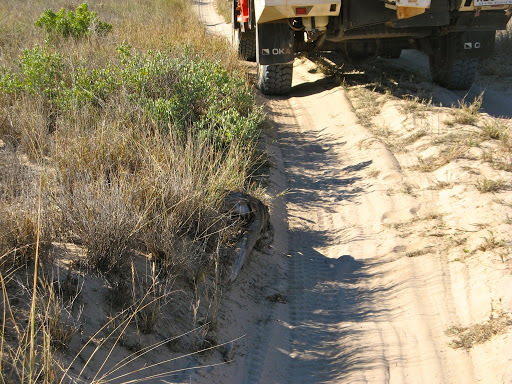 Very bad track but we found the final campsite 50m from the beach. 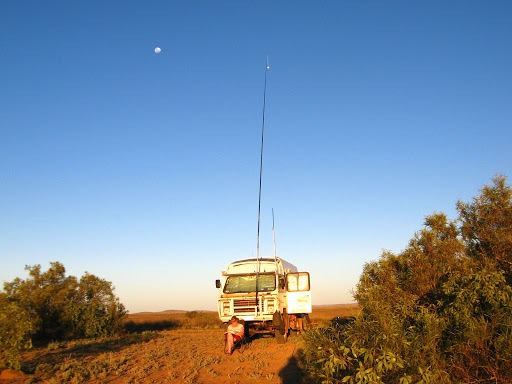 Rigged up Yagi antenna to get Coral Bay Telstra network and got good email, from D and P at home and 2 emails from Mark frustrated due to difficulties in fixing my rear car electric window which keeps falling down. I decided my thumb has been troubling me for long enough and wasn't improving. 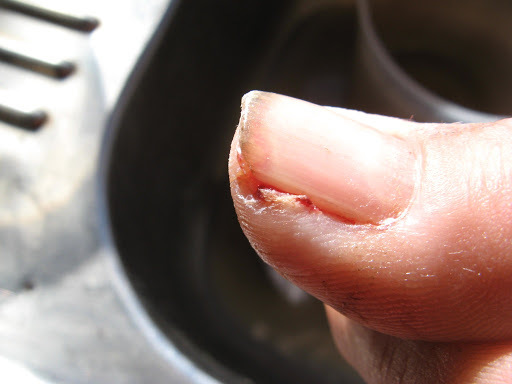 It was making me very depressed and grumpy (so I'm told, I hadn't noticed) so this morning I resolved to fix it (we were several days away from the nearest doctor) and did some surgery to remove the piece of flesh which had emerged from beneath the nail. It had an exposed nerve in it which made me jump every time something touched it. 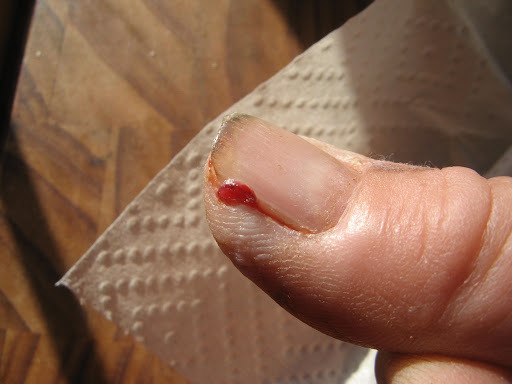 I sterilised my Swiss Army knife blade in a flame, covered the affected area with antiseptic cream and cut off the offending piece against the nail. It was quick and bled a bit but didn't hurt too much. A tight plaster and it was left to heal. Trolled down to Sandy Bay for lunch and a look around. Nice sandy campsites along the beach, all full up, as was the overflow camping area.Went further down to Pelican Point along a very sandy track. 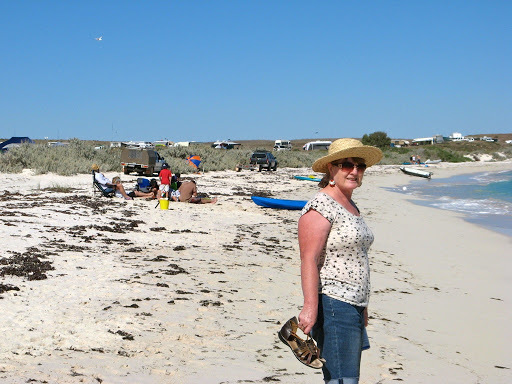 All alone on a very remote beach after a boat trailer squeezed past us. Apparently they had been fishing illegally, as Pelican Point is a sanctuary and all types of aquatic hunting and gathering are banned in that area. We found a beautiful, still hinged oyster shell on the beach, complete with real pearls inside (albeit very small ones), which we hunted and gathered, probably illegally. 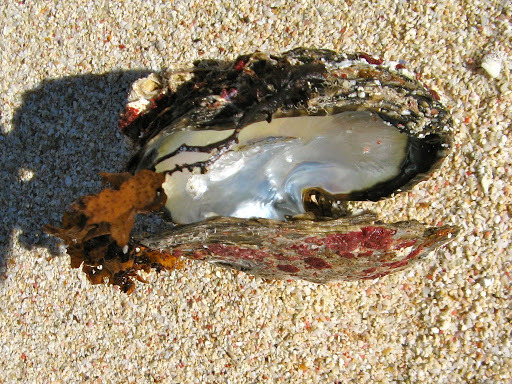 Now how did this oyster get here on the beach without illegal hunting and gathering? Nearly staked a tyre on the way out on a tree stump hidden in the shadow of a clump of grass on the side of the track. Fortunately it only grazed the tyre wall. 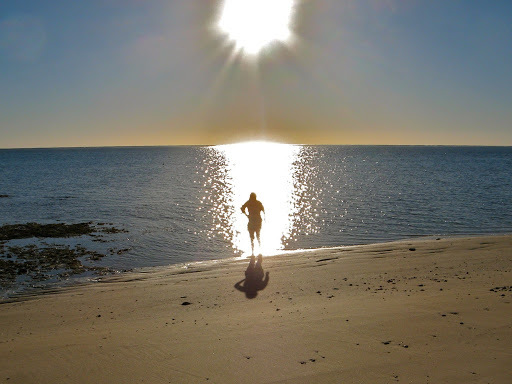 Had a nice walk on the beach and J nearly got beamed up in the sunset. My thumb is much better today, since you asked, and I can almost use it for the space bar again. My surgery has worked well and I now feel confident to take on more complex surgical tasks, like shaving or gall bladder removal. 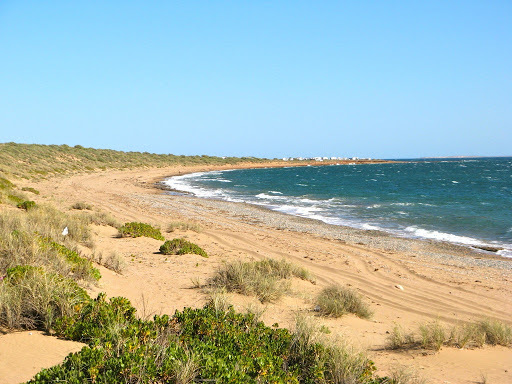 We moved to a more sheltered campsite nearer the beach and on sand, not prickly grass. Dug some sand out from beneath the front wheels to level things, and I was surprised how easily the wheels sank in as I removed sand from behind them. 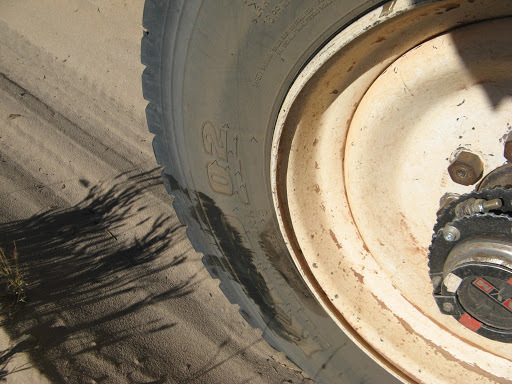 I wondered if lifting it up could be accomplished as easily by piling sand up against the wheels. Had a lay day to catch up on reading but after lunch simply had to exercise some muscles so we walked a long way up the beach and found clam shells amongst the rocks. Had a good happy hour with neighbours, some of whom stay here for long periods each year. The campsite hostess and Mr Hostess live hear all year round in a small caravan, even when it reaches 55º and the sandflies are biting. Don't think I could do that, however enticing the ocean views are. Another lazy morning but eventually we had to move so down along the beach again we went. 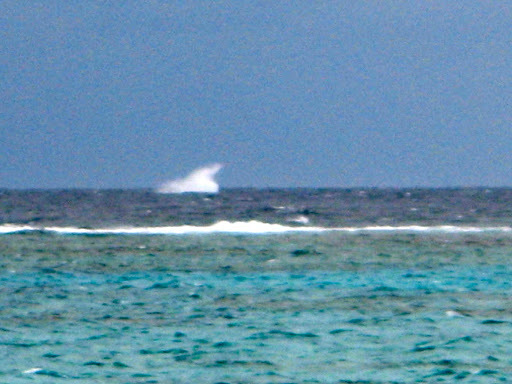 As we walked along the beach we watched whales breaching and sploshing just beyond the reef. 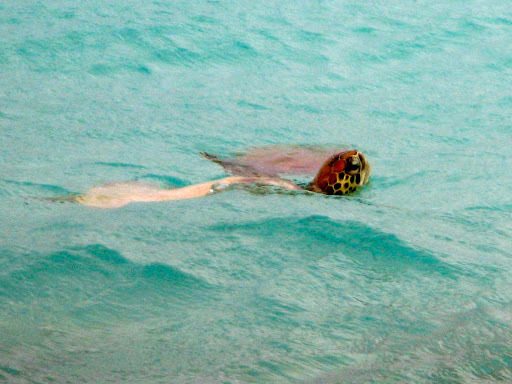 We also watched a green turtle feed on sea grass a few meters from the beach and coming up for breath every few minutes. But happy hour was cancelled today since a cool, wet gale blew in from the sea late in the afternoon and it was windy and rained lightly all night. Sun came out in the morning as the dark clouds moved on to ruin someone else's holiday and we put all the outside furniture in the sun to dry off. Packed up and drove down the coastal tracks through Warroora Station and stopped at a PGL (Pretty Good Lunchspot) overlooking Stevens Beach. 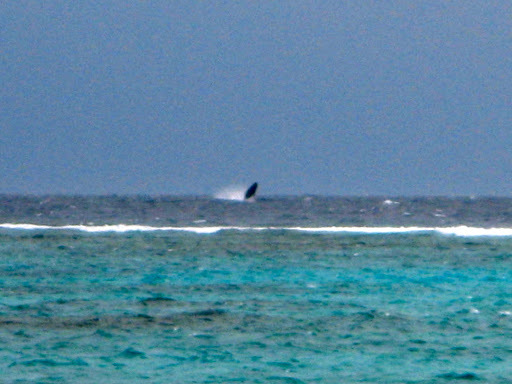 We watched dozens of whales in small pods as they made their way up the coast, sploshing and "thar she blows-ing" on the way. 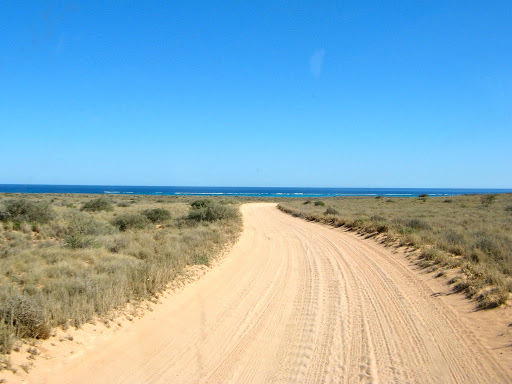 Had to leave Warroora Station eventually and made our way to the main highway, south through Minilya towards Carnarvon. Camped at a rest area about 80kms north of the town. But my thumb is now entirely healed and trouble free. A breakthrough in outback medical science and a plus for my Swiss Army Knife. Drove into Carnarvon and around the town. It's very spread out with several caravan parks, 2 hardware stores and copious numbers of "No Camping" signs. We did our usual trick emptying of supermarket shelves (Woolies) and found a very average Caravan Park with NO unpowered sites. 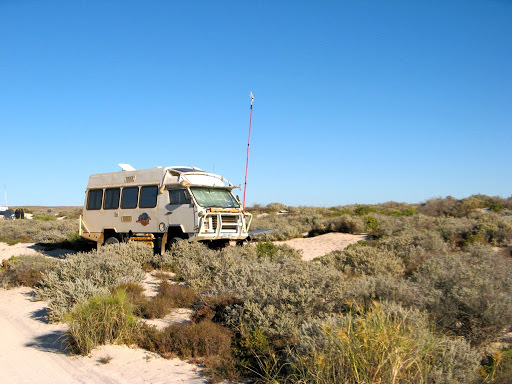 Warning: Rant Follows: Unpowered sites are fast disappearing from CPs, due we are told, to the number of backpackers who stay in unpowered sites and then connect up with extension leads to steal power. Sounds like a very weak argument for not being able to manage a trivial problem and abandoning self sufficient travellers who don't need and can't use mains power, just to charge $4 a night extra, and NO pensioner discount either. My faith in Caravan Parks, such as I had, has taken yet another beating. 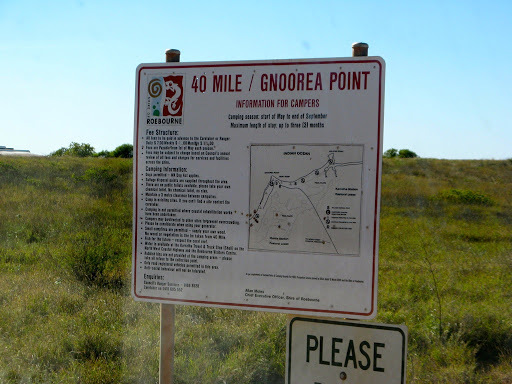 Continue our trek here, via the inland route through Gascoyne Junction, Mount Augustus and Nullagine to Marble Bar.